Your website is constantly evolving and will most likely need frequent updates to keep things fresh and secure. Just like the software that runs your computer at work & home. Because there are people out there who thrive on finding little hacks and backdoors into these scripts, the developers are constantly releasing updates to keep your site safe. If you don't keep your site up to date, it could result in your site becoming broken or worse yet, infecting your visitors' computers with malware. Yuck! 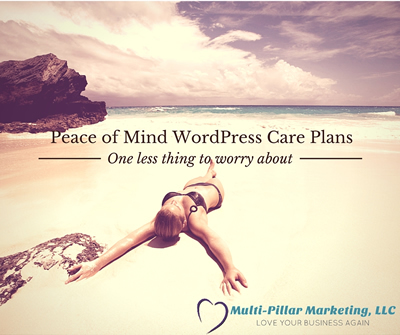 Because most of our clients are scared of this and worry that they may break something on their site if they try updating scripts themselves, we've created these Peace of Mind WordPress Care Plans. Even if you know what you're doing, but just don't want to have to worry about taking care of it, this is a great service for you. With all of our plans, we will log in on a regular basis and make sure all your scripts and plugins are up to date and backed up. If you have any minor changes that need to happen monthly, we can take care of those too! We'll also send you monthly reports to show you how your site is performing. If you don't have it set up already, we'll install Google Analytics and send you reports so you can see how many visitors are coming to your site as well as how long they stayed, what other pages they visited, where they were referred from and even what keywords they used to find you! If you're looking for more focused attention to your website, as well as marketing strategy, there are two upper level care plans that would suit you well. Our Webmaster plan includes higher priority support, as well as increased service credits for your account. If you're looking for ongoing strategy & implementation, why not Partner up with us for the highest level of care. Take a look at the packages below and let us know if any of them sound good to you. We can hop on the phone to discuss or even change things if you have different needs. OK?